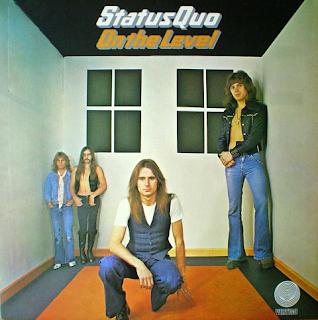 Another of the great seventies Status Quo albums, with the band at the height of their hard-riffing success. It did't ever get any better than this for them. It was a number one album. 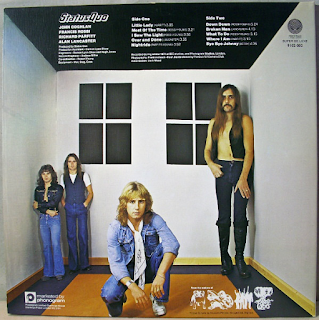 "Little Lady" is typical Quo fare - trademark riff, drums and vocal (Rick Parfitt, this time). It does have one of those parts where the riffing briefly stops and it goes quiet, before building back up again. Quo do that quite a lot. The track merges straight into the slower, Ronnie Lane-esque "Most Of The Time". After a few minutes, though, it kicks into a slow-paced Quo rock ballad. Francis Rossi does his best at times to give us a Paul Rodgers-style vocal, but his voice is too high and whiny, unfortunately. "I Saw The Light" is back to archetypal riffing. Look, I know the formula doesn't change much, but if you like it, you like it, and I do. "Over And Done" is another fast-paced rocker, although the guitar sound is slightly lighter, despite the riff being pretty much the same. "Nightride" is a chugging rock groove, solid and industrial. Then comes "Down Down", the band's biggest hit single. It needs no introduction, really. Heads down, no nonsense Quo boogie. On the album you get the full album version, which has a delicious little bit of guitar interplay before it unfathomably fades out. "Broken Man" doesn't break much new ground, but "What To Do", despite the seventies riffs, has a feel of Quo's psychedelic sixties material about it. "Where I Am" is a surprisingly airy, light slow number before the album ends with a rollicking cover of Chuck Berry's "Bye Bye Johnny". It ends, oddly, with a brief chorus of "You'll Never Walk Alone" as sung by Liverpool fans. Not quite sure why. There is no pretension to this album, as you would not expect there to be. It rocks, Status Quo-style from beginning to end.